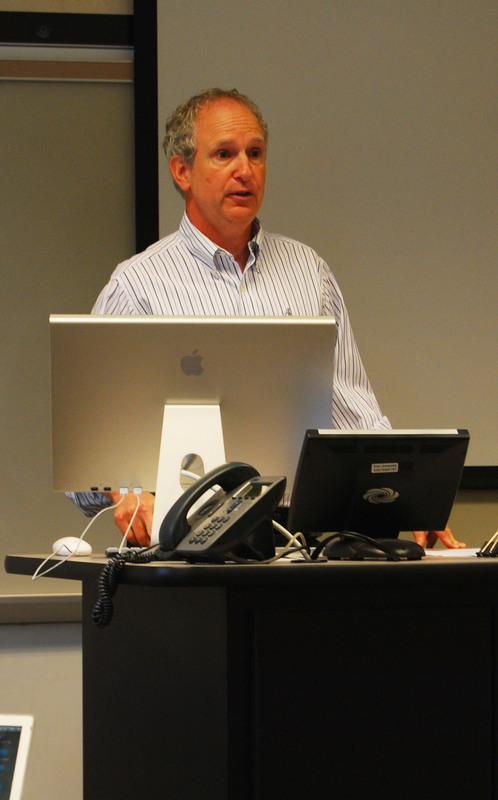 Steve Riley, senior editor for enterprise reporting at the Raleigh News & Observer, began his career as a sports writer in Mississippi. Photo by Julia Sayers. In his eight years as the N&O enterprise editor, Riley has found that “writing with authority” is the key to a powerful investigative story. “Writing with authority means you’re going to lead them somewhere, because you’ve spent the time, you’ve done the work, you have exhausted everything you know to do to be able tell the reader what the truth is,” he said. In fact, many of the stories published by the enterprise staff include assertions and strong statements, made possible because the reporters have completed their work thoroughly. Although the need for authoritative writing has not changed since Riley began working about 30 years ago, the readership is continually changing, which has brought about change in the presentation of information and stories. The goal for Riley and his three-person enterprise team is journalism with impact. Stories written by Riley’s team have led to the removal of judges from their courtrooms, the exposure of a half-blind, colorblind neurosurgeon whose work was leading to serious medical issues, the disbarment of the Durham district attorney involved with the infamous Duke lacross case and former Governor Mike Easley’s guilty plea for accepting bribes. For Riley, that is what it’s all about. “Good journalism is indispensable to the future of the country,” he said. Also, allowing sources to understand what will be published about them before it is done, simply for the sake of honesty and fairness, is an important step to take. Nice work on this, Kellye! I wish it had been up online sooner. I sent Steve the links to all the student work that was posted by midnight the day he spoke. You did well structuring this in a tight, informative online media format.